Pink dolphins swim in the mighty Amazon River, presented a beautiful and magical sight. They are freshwater dolphins and get their colour because of the blood vessels so close to the skin’s surface. There are various myths and legends surrounding the pink dolphins, and as such they are fairly respected by Bolivian people. As well as in the Amazon River you can also find these graceful creatures in the Mamore, Itenez, and Madeira Rivers. The slow moving and lazy sloth can be found in Bolivia, and is very easy to spot! They can be found in cities and urban areas as well as in the jungles and forests, and Santa Cruz is a well known place for being able to see sloths just hanging out and not doing an awful lot! Another interesting animal that lives in Bolivia is the capybara. It is the biggest rodent in the world, and adults usually have really big teeth! 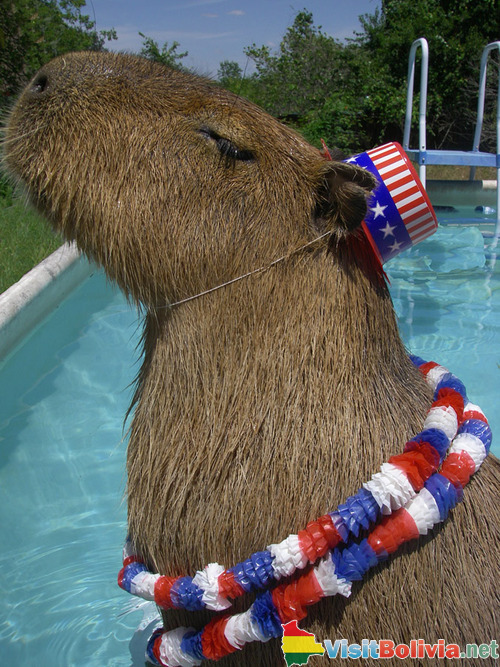 A capybara can weigh up to 45 kilograms. They like to live in the water, and many locals associate them more with fish than with mammals. There are various different species of cat in Bolivia, including the domesticated household cat, ocelots, Andean Mountain Cats, jaguars, and cougars. From the dog family you will find dogs, wolves, and foxes. Obscurely, in the Bolivian Amazon area people have discovered a type of dog that has two noses! Other carnivorous animals in Bolivia include coatis, raccoons, otters, weasels, and skunks. Bolivia is home to five different types of camelids; camels, llamas, alpacas, guanacos, and vicunas. They are important for their fur, which is used to make warm clothing. Another animal that is used for its fur is the chinchilla. There are animals from the armadillo family, anteaters, apes, monkeys, lemurs, bats, a variety of rodents, rabbits, whales, tapirs, opossums, butterflies, lizards, and more. 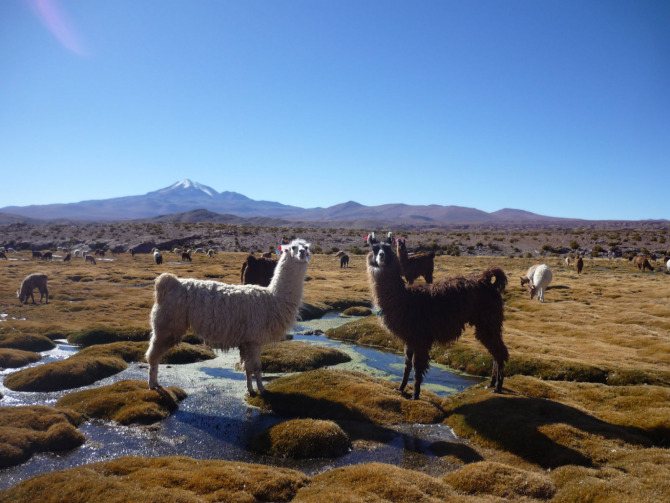 Some great places to visit for a chance to see some of Bolivia’s terrific wildlife include Lake Titicaca, Salar de Uyuni, Chaco, Noel Kempff Mercade National Park, Madidi National Park, Santa Cruz, Lomas de Arena Park, Refugio Los Volcanes, Amboro National Park, Laguna Alalay, Buena Vista Marshes, and La Cumbre Pass. Generally, the best times for seeing Bolivian wildlife are between April and November, where conditions are drier and creatures are more likely to venture out and about.